Petroquímica en Venezuela: Venezuela, joint ventures, petrochemicals and oil. Venezuela, joint ventures, petrochemicals and oil. After reading short gossip, Shell has said that the big oil companies are not interested anymore in doing business in Venezuela. The politic environment in the country is simply not good. Although for an oil business is not necessarily bad news (Saudi Aramco, the NOC from Saudi Arabia is capable to develop a project equivalent to the whole venezuelan oil production), for Venezuela and specially for its petrochemical business -in my opinion- is bad news. The political partners of Venezuela, who have developed their petrochemical business are Brazil and Iran, but they are not technology licensors, and our petrochemical projects will be "their" petrochemical projects. 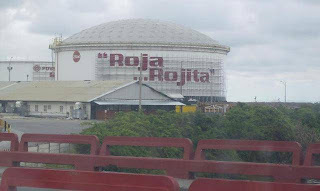 Como muestra un botón: Brazil (Braskem) its reconsidering the location of the PP plant (previously planned in Jose), will be the new location in Venezuela?